Merry Christmas! This is Mom; I have the privilege this year of starting our 12 Days of Christmas posts. Projects often start with a swatch, right? I bought this yarn from Tess Yarns at the MD Sheep and Wool Festival in May. It’s a blend of silk and alpaca. Lovely stuff, as soft as cashmere. I loved knitting with it. 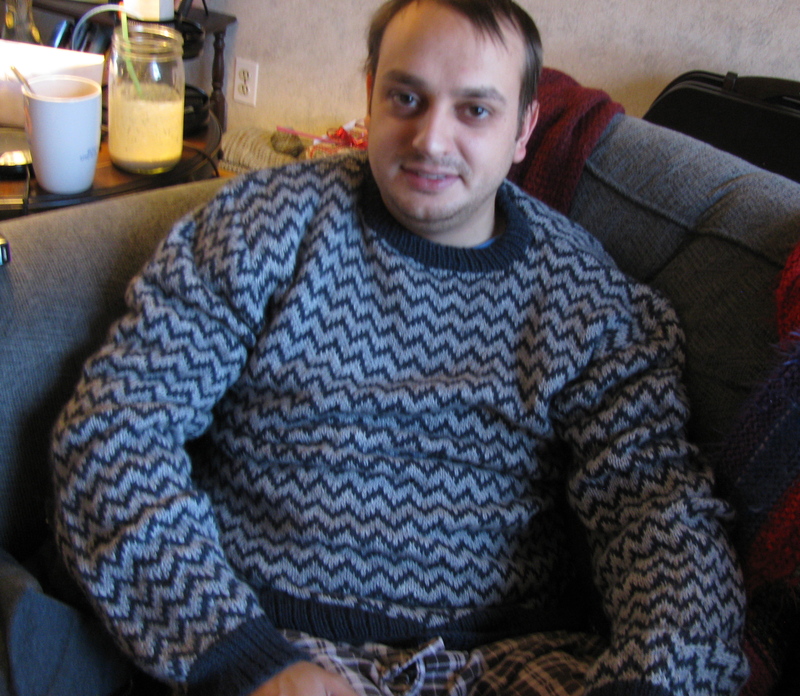 Jared had picked a fair isle sweater from Mens Knits by Erika Knight last year, and by August I was ready to start it. [Apparently mom is the first ravelry user to have attempted it, or I would link it for you. 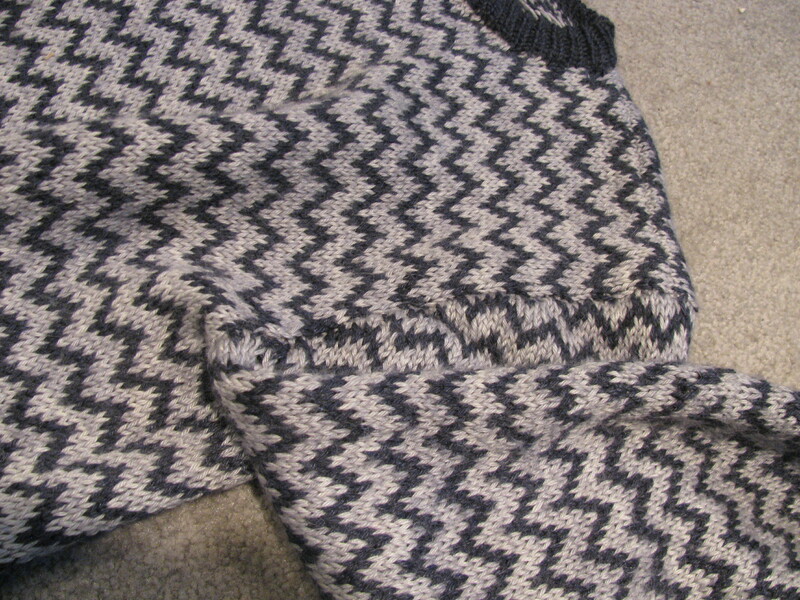 ~Rebecca] Size 5 and 7 needles, a herringbone repetitive pattern, and it went knit up quickly….in time for Christmas; whew! I have found that swatches are not always needed, but certainly this time. The first 2 swatches are knit exactly like the chart in the book. Even going up a needle size didn’t make a huge difference for me; I didn’t like it. Then I modified the pattern on a piece of graph paper, knit up the results and asked my husband and Rebecca to give input. All 3 of us agreed that the modified herringbone looked best in these yarns. 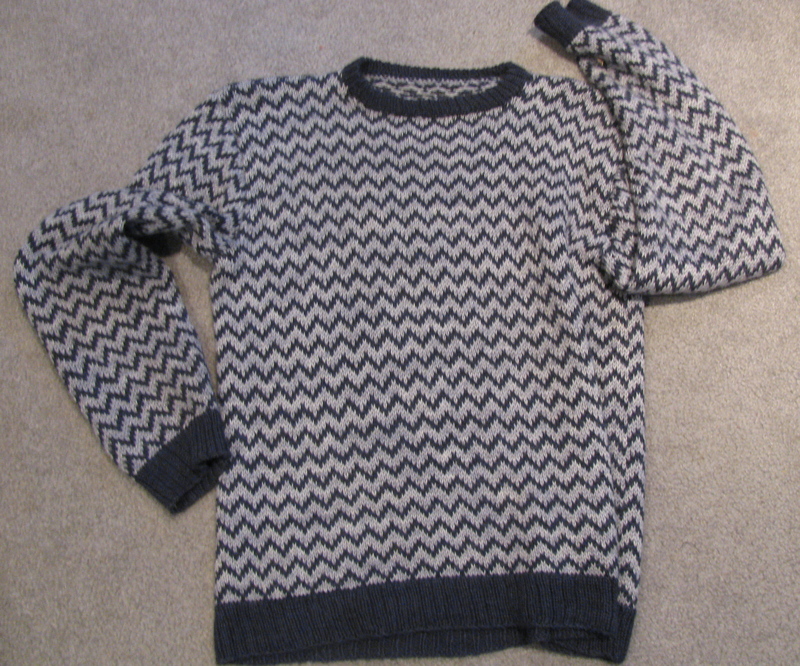 After having knit the Alice Starmore sweater with Rebecca on size 3 needles, this one was a piece of cake. It called for the pieces to be knit flat, but armed with my new circular skills, I knit the body of it in the round, and put in my own arm hole steeks. I was jolly proud of myself and pleased with the results. Now you’ll note I did not use steeks when knitting the neck. I went ahead and did that back and forth. I also knit the sleeves in the round, up to the arm holes, then knit the sleeve caps back and forth. It worked! I had never done a modified approach, so I was happy to learn from other knitters that this is not unheard of. Lots of people knit in the round AND the flat in the same project. Cool. Knitting fair isle mostly in the round was much more pleasant. Yay for options! 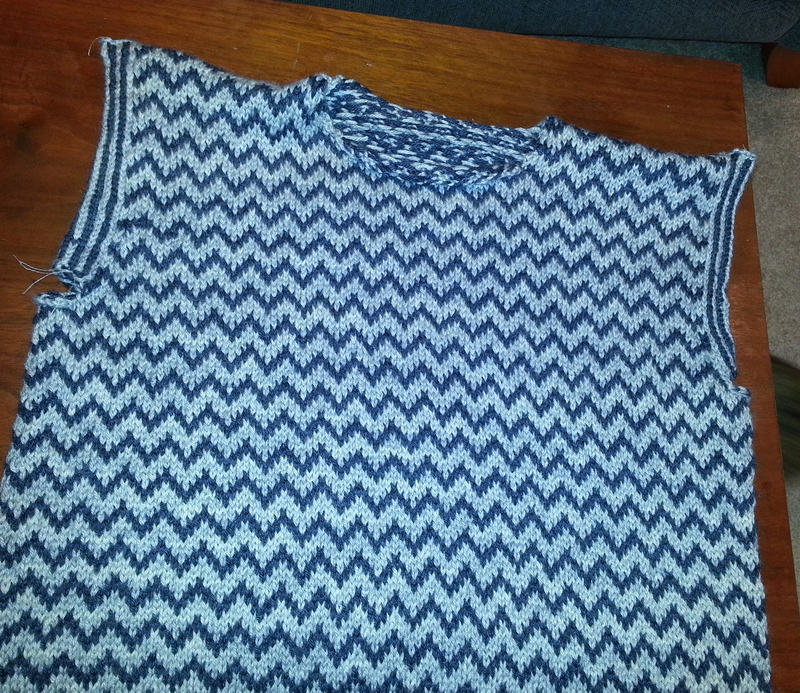 After all the basic knitting was done, I sewed the arm holes together and knit the neck line. Jared had asked for a crew neck rather than a V-neck. Before cutting the arm hole steeks, I sewed a doubled line of stitching on a sewing machine…..on both sides of the cut line. Then I cut it down the middle AND serged the ends with a serger machine. This was not totally necessary I think. I only did it because I had a serger from earlier days when Rebecca was an ice skater and I learned to sew on lycra. After securing the ends, I used yarn to sew down the hem. Then I sewed on the sleeves, right sides together. You can see from this picture that I was not able to match up the patterns from row to row, but I decided that was OK. Here is where my skill is at; I will keep working on it. Note also the shoulder seam and the arm hole seam. 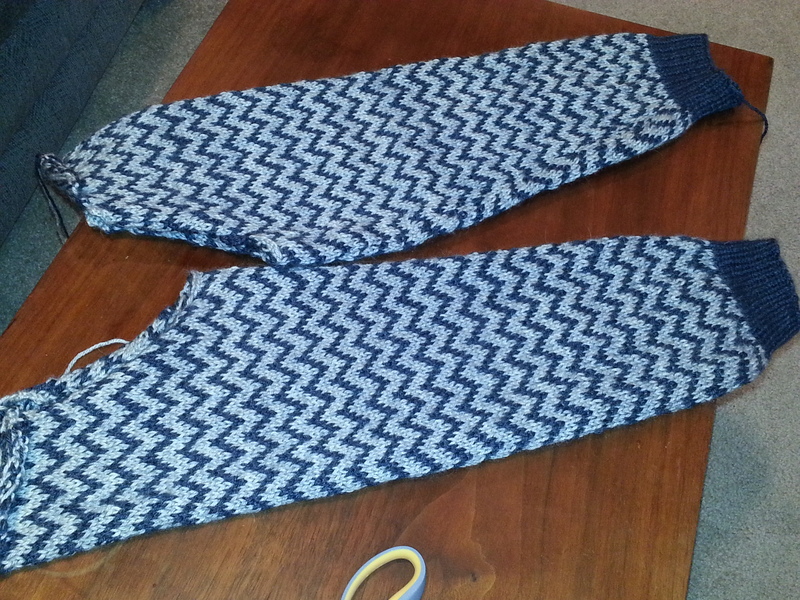 It WAS nice at the end to only have those two seams to complete. And now finally for our man, Jared, to model the sweater! Doesn’t he look dashing? Pretty good considering he was a bit sick on Christmas Eve and Christmas Day. He made my day by wearing it ALL day, saying it was “so soft.” I beamed. The arms are a bit long, but I can fix that if he wants me to. No big deal. It actually looks great on him; he picked an excellent pattern. Linda, it’s really beautiful! It looks like it was fun to make, and I would not have noticed the pattern matching if you hadn’t mentioned it. How long did it take you? I began the project in late August, and worked on it nearly every day until the weekend before Christmas. There was a pause in the action for a couple weeks before the Alpaca Festival. So 14 weeks…..an hour a day……something like that. As you can probably see in the last picture, the sweater is a little big in the shoulders for Jared. The sleeves are also too long. I tried it on him and pinned it so the shoulders were more narrow; and I’m going to go ahead and take off the sleeves, shorten them by taking off an inch at the bottom of the sleeve and re-knitting the cuff. Then I’ll re-sew the steeks and arm hole seems so as to make the shoulders more narrow. Then it will actually look great on him instead of so-so. I think it will only take a week…..one more week? Why not? Sounds like a job, but go for it! Let me know how it turns out.